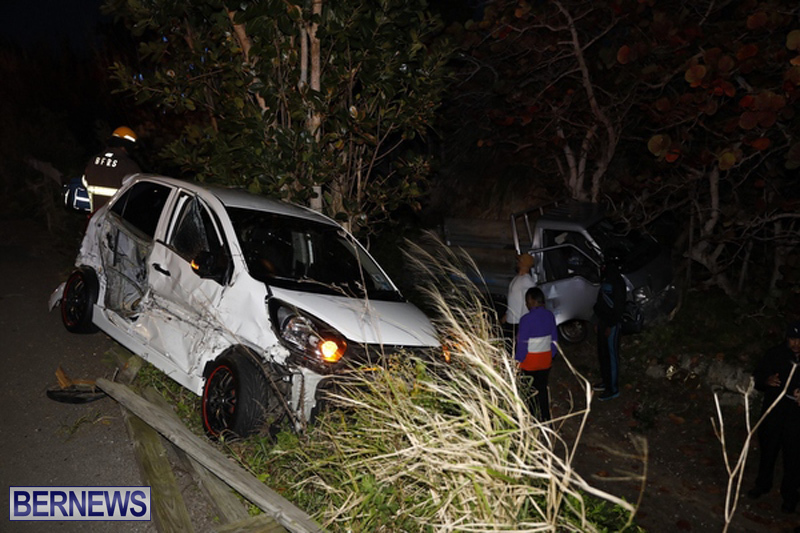 [Updated with video] Earlier this evening [Feb 9] there was a three vehicle collision on North Shore in Hamilton Parish, in the vicinity of Shelly Bay, the police have confirmed, with the police noting that there were “no serious injuries.” Further details are limited at this time, however we will update as able. 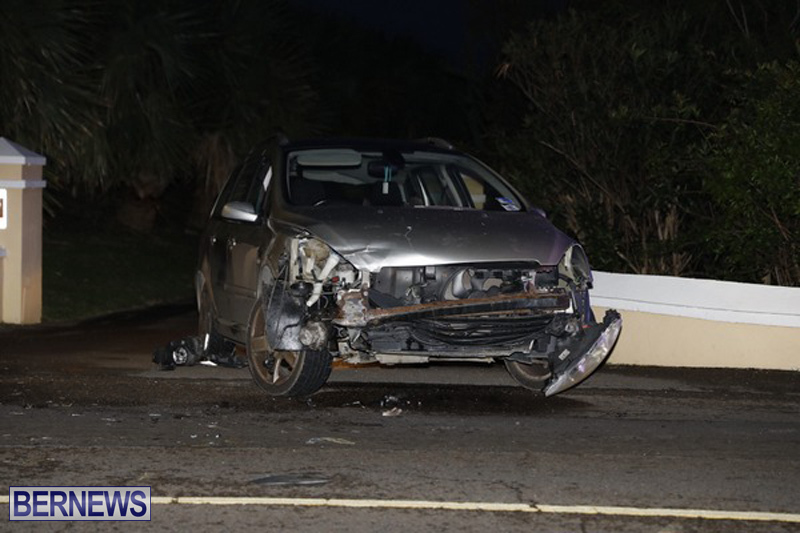 Update February 11, 4.50pm: A police spokesperson said, “Around 6pm Saturday, February 9th police and fellow first responders were dispatched to a reported three vehicle collision at the junction of North Shore Road and Somers Hill Road in Hamilton parish. 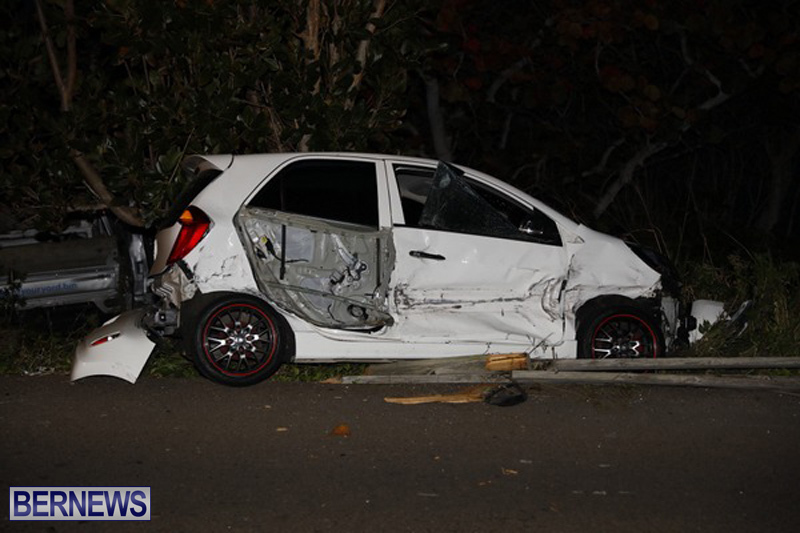 “It appears that the collision occurred as a car driver attempting to exit Somers Hill Road and a light truck driver traveling in the eastbound lane of North Shore Road were struck by another car driver traveling eastward, who attempted to overtake the light truck. 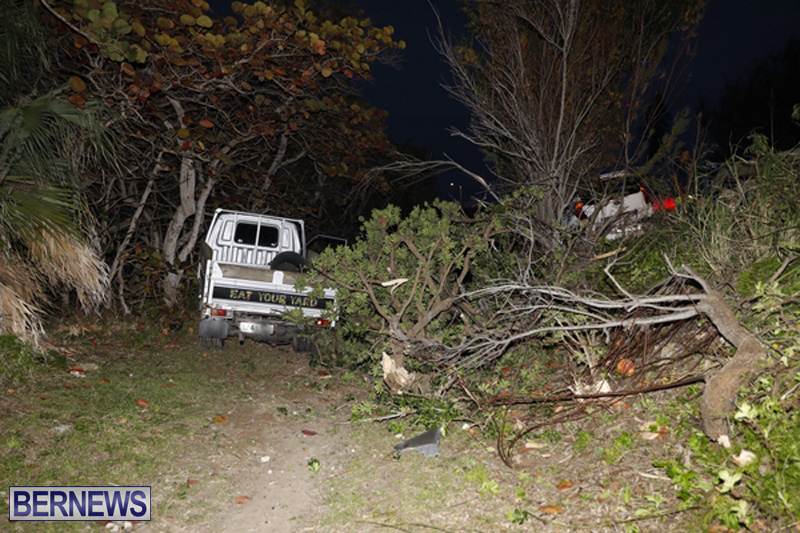 “All three vehicles involved were damaged, with the eastbound car ending up on an embankment and the light truck over the embankment, ending up on the Railway Trail. “Apparently a passenger in one of the vehicles, said to be a 10-year-old girl, sustained a minor mouth injury and was treated at the scene by emergency medical technicians. “There were no other injuries reported and traffic diversions in the area were in effect for approximately one hour. This is a picture of how the economy is being run. Will the police at some point post the footage of this avoidable accident?? oh you think the Police have cameras on that part of the road? No idea what the cause was here but just another example of the craziness on the roads . I decided to head west late this morning. There was no traffic in sight behind me at Hitching Post but was shocked to have a black Suzuki car come out of nowhere and fly past me on the apex of the bridge. He took the entire oncoming lane and almost got the car airborne. Someone exiting Robinson’s gas station saw the whole thing and was stunned , just shaking his head. I grew up in era when people slowed to a crawl going over that bridge but now it’s treated like a berm at Coney Island. Oh , and I was on a bike nonetheless . It is going on constantly… every moment on the road. 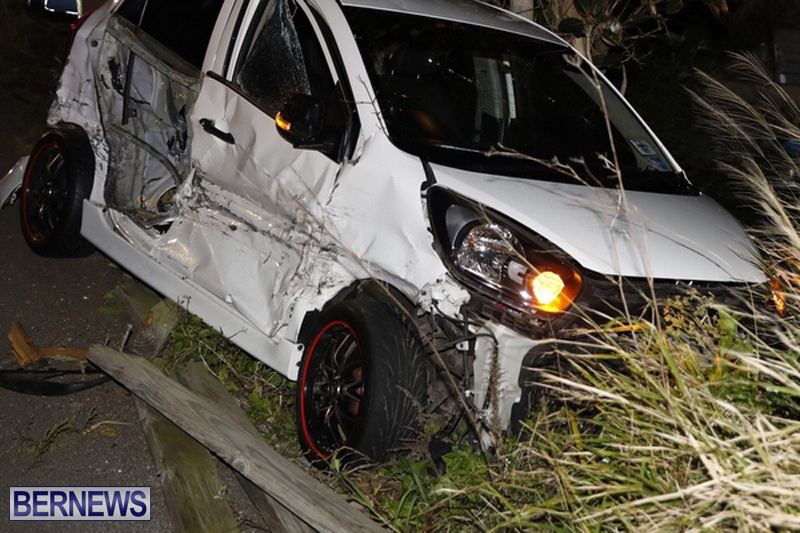 Every time a vehicle passes another, overtaking or meeting, they are two seconds away from an ‘accident’ and results in another maimed motorist or worse, end up in the hole in the ground. For what, trying to save five minutes to get to Hamilton? Idiots and just don’t give a ‘F’ for themselves or anyone else either! School kids are bad too. Turn 16 and without a thought they go out on a bike and think they are fearless and are overtaking like everyone else. If you drive like that… your precious 16 year old CHILD will get killed too! How about the idiot speeding and overtaking with a small child on the back of the bike? More to come people don’t respect there own lives, we stand little chance. Bernews you need to start a name and shame type of page. People can maybe write, time location and license plate.. will see how many repeat offenders we have in the same area.